Get the full scoop on Disney's next Diamond Edition hitting Blu-ray this March! 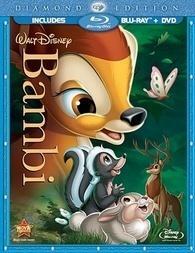 As previously reported, Disney/Buena Vista has planned 'Bambi (Two-Disc Diamond Edition)' for Blu-ray on March 1. 'Bambi' was Walt Disney’s fifth animated full-length feature film which released in 1942 during World War II and took approximately five years in the making due to the exquisite artwork and attention to detail of each and every scene, character and figure. The artwork itself was created by some of the legendary “nine old men,” including Frank Thomas, Ollie Johnston, Marc Davis, Milt Kahl and Eric Larson and in order to achieve the film’s unprecedented level of realism, animators modeled anatomical studies using live animals (including a pair of fawns named Bambi and Faline) and imbued each with a uniquely endearing personality. Bambi’s delightful forest home received the same painstaking attention to detail, as background artists painted hundreds of landscapes based on extensive field research and nature photographs. Disney’s new “Second Screen” technology, which is being introduced for the very first time on the 'Bambi' Diamond Edition release, will further transform the at-home movie watching experience by empowering viewers with the ability to engage with film content on multiple media platforms and bring them to life in their own hands at the touch of a button. By simply downloading the new Disney Second Screen App onto an internet-connected computer or iPad™* and synching it to the movie, consumers will instantly be able to dive deeper into the film by engaging with fun interactive elements like animated flipbooks, galleries, photos, trivia and more. 'Bambi' was nominated for three Academy Awards® for Best Song (“Love Is a Song,”), Best Sound Recording, and Best Music Score of a Dramatic or Comedy Picture. To date, 'Bambi' is No. 3 on the list of American Film Institute’s Top 10 Animated Films of All Times. And in 2004, the movie was commemorated with a first-class U.S. postage stamp and in the 1990’s the film inspired astronomers to name a pair of asteroids after the adorable characters – Thumper (April 20, 1993) and Bambi (October 17, 1995). The release will be available as a Blu-ray/DVD combo pack (as well as a DVD/Blu-ray combo pack w/DVD packaging) with 1080p video, a DTS-HD Master Audio 7.1 soundtrack, and supplements include: The Making Of BAMBI: A Prince Is Born—A comprehensive look at the making of BAMBI covers the story, the characters, the actors, the art design, the music and the history of Walt Disney’s classic film using behind the scenes footage, production stills, animation, artwork and multiple interviews withperformers and behind the scenes participants; Tricks of the Trade (excerpt)—In an episode from the 1957 Disneyland TV show, Walt narrates the story of the multiplane camera, an animation innovation crucial to the production of BAMBI; Inside the Disney Archives—Disney Supervising Animator Andreas Deja guides viewers through Disney’s Animation Research Library, where artwork from past Disney animated feature films is stored, including early story sketches of Bobo the rabbit,” (who became Thumper), glass paintings made for the multiplane camera and more; The Old Mill—Winner of the 1937 Academy Award® for Best Short Subject/Cartoon, The Old Mill was a testing ground for several techniques critical to Walt’s artistic vision for BAMBI, including the multiplane camera, animating realistic animals and experimenting with such natural occurrences such as wind, rain and lightning; and DisneyPedia: Bambi's Forest Friends. Blu-ray exclusives include: Inside Walt’s Story Meetings-Enhanced Edition - A fascinating, multi-tiered, interactive story-telling experience. Go back in time with dramatic voice re-enactments of the moments with Walt that led to the creation of this classic film; 2 Never Before Seen Deleted Scenes; Deleted Song: “Twitterpated”; Blu-ray Galleries—A collection of the extraordinary images originally created as part of the design process for BAMBI; Family Play: Games & Activities; and Disney’s Big Book of Knowledge: BAMBI Edition— An interactive educational gaming experience that uses the film as a learning tool. Players can customize their own Big Book of Knowledge and learn all about forest creatures, seasons andmore! Each time a player completes a task, they are rewarded with new stickers to decorate their Big Book of Knowledge. Suggested list price for each combo pack is $39.99. You can find the latest specs for 'Bambi (Two-Disc Diamond Edition)' linked from our Blu-ray Release Schedule, where it is indexed under March 1.